If you’re an enthusiastic photographer looking for a compact camera that you can slip in a pocket and take anywhere, Sony’s RX100-series offers a great choice with a much larger-than-average sensor for spectacular image quality. But what if you prefer a far-reaching zoom lens, and are willing to trade off on sensor size to get it? Well, that’s where the 18-megapixel Sony HX90V comes in. 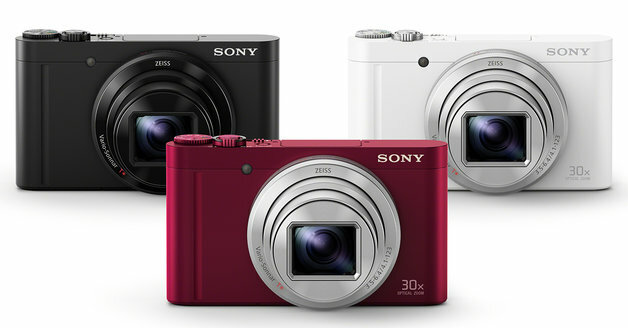 Clearly aimed at photographers who prefer to shoot with the camera to their eye, rather than shooting at arm’s length as is the norm these days, the Sony HX90V is claimed to be the world’s smallest compact camera to feature both a built-in viewfinder and zoom lens with 30x or greater reach. 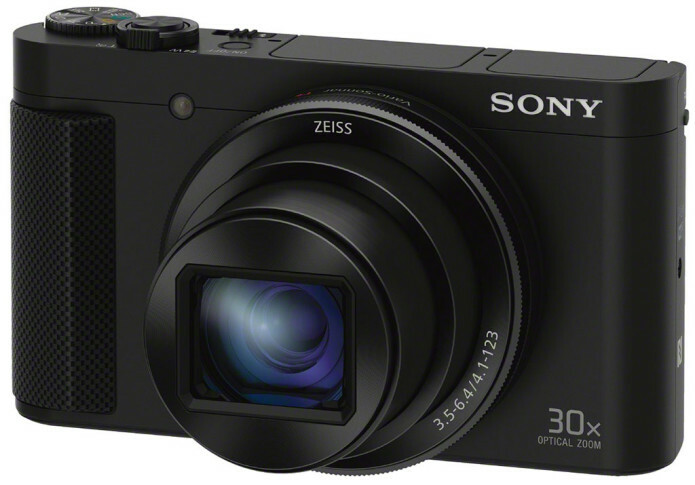 What makes this all the more impressive is that it’s barely any larger or heavier than the smallest 30x zoom camerawithout a viewfinder, too — the simultaneously-launched Sony WX500. 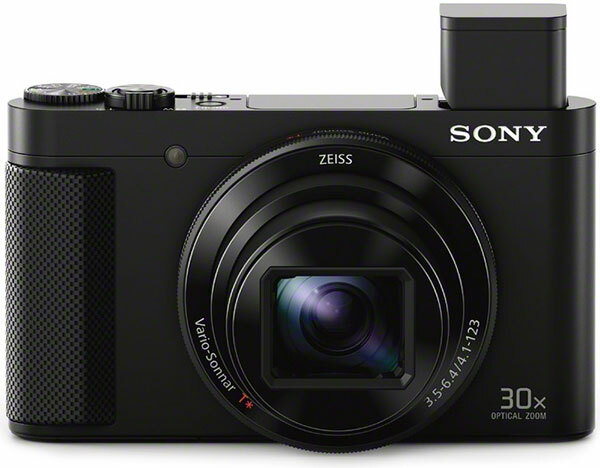 With styling reminiscent of the Sony RX100-series, the HX90V definitely looks the part. 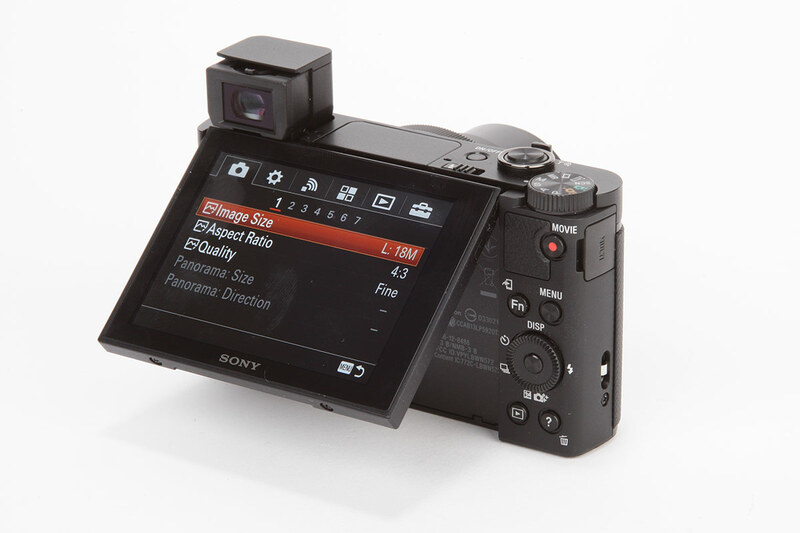 Indeed, its control layout is near-identical to that of the Sony RX100 III, right down to the control dial that surrounds the lens barrel on the front of the camera’s body. Unlike the RX100-series, though, the Sony HX90V sports a low-profile front handgrip that should help you keep the camera steady, a handy addition in a camera with such a far-reaching lens. Inside, the HX90V pairs the same BIONZ X-series image processor from the RX100 III with an 18.2-megapixel Exmor R-branded CMOS image sensor. Although it’s much smaller than the 1″-type chip in the RX100-series cameras — the price you pay to achieve such a far-reaching lens in a body that’s as near as makes no difference identical in size to the original RX100 — it does feature a backside-illuminated design that helps improve its light-gathering capabilities. And if the ability to bring far away subjects up close and personal is a key goal in your next camera purchase, the new 24-720mm equivalent 30x zoom lens in the Sony HX90V will definitely pique your interest. It now carries Zeiss Vario-Sonnar T* branding, rather than the Sony G branding of the HX90V’s nearest predecessor, the 2013-model year HX50V. And while its maximum aperture of f/3.5-6.4 across the zoom range is understandably a little on the dim side, given its compact nature, the design features five-axis Optical SteadyShot image stabilization, helping to reduce the likelihood of blur from camera shake. It’s that popup, electronic viewfinder that’s the really big news, though. It’s based around a 638,000-dot equivalent Organic LED panel, and not only will it let you frame with the camera to your eye, it will even disable the LCD monitor for you automatically as you do so. That’s achieved courtesy of a proximity sensor beneath the eyepiece. All that, despite a dust-resistant viewfinder design which Sony tells us is around 50% smaller than that of the popup finder in the RX100 III. On the rear panel, you’ll find a selfie-friendly 3.0-inch LCD monitor with 921,000 dot resolution, mounted on an articulated mechanism that can tilt upwards a full 180 degrees, allowing for framing from in front of the camera. And there’s also a built-in, popup flash strobe on the top deck. Nor is that all: The Sony HX90V can shoot 50Mbps Full HD movies using XAVC S compression at up to 60 frames per second, and it sports a full complement of Wi-Fi, NFC and GPS antennas built-in. That means you can have your photos tagged with their capture location automatically, just like your smartphone does, and once you’ve shot them it’s a quick-and-easy process to share them online for friends and family to see. Let’s take a closer look inside this interesting camera, and see just what it offers for your money! 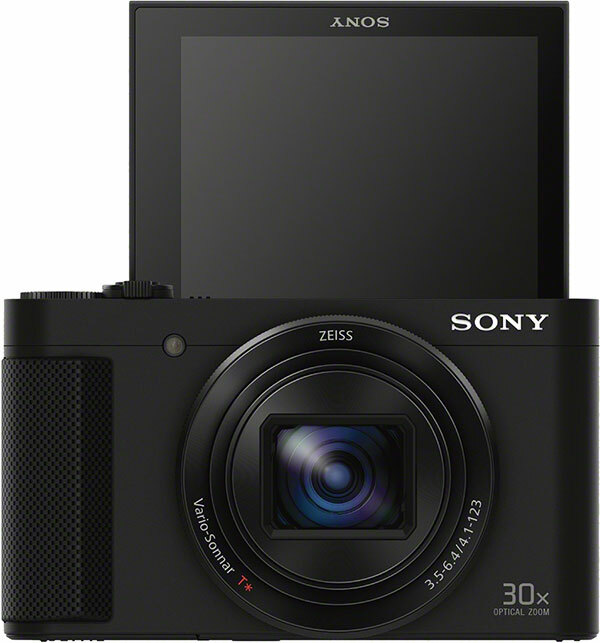 The Sony HX90V is based around a 1/2.3″-type, Exmor R-branded, backside-illuminated CMOS image sensor with an effective resolution of 18.2 megapixels. Total resolution of the imager is 21.1 megapixels, and it has a 4:3 aspect ratio. Output from the image processor is handled by Sony’s proprietary BIONZ X image processor. 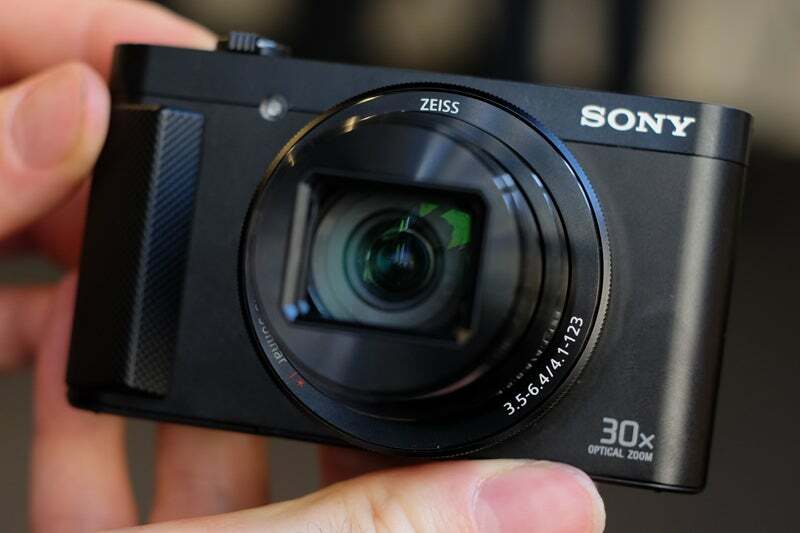 That’s the same type used in the Sony RX100 III enthusiast compact, and it’s said to have approximately triple the performance of the BIONZ chip in the earlier HX50V. The Sony HX90V’s 30x optical zoom lens bears Zeiss Vario-Sonnar T* branding, and provides a 35mm-equivalent focal range of 24-720mm equivalent when using the 4:3 aspect ratio. Actual focal lengths range from 4.1 to 123mm, and the maximum aperture falls from f/3.5 at the wide-angle position to f/6.4 by the time you reach the telephoto position. The lens’ optical formula includes 11 elements in 10 groups, of which five elements are aspherics. There’s a five-bladed aperture iris, and five-axis SteadyShot image stabilization is also included, combining both optical and electronic stabilization techniques. 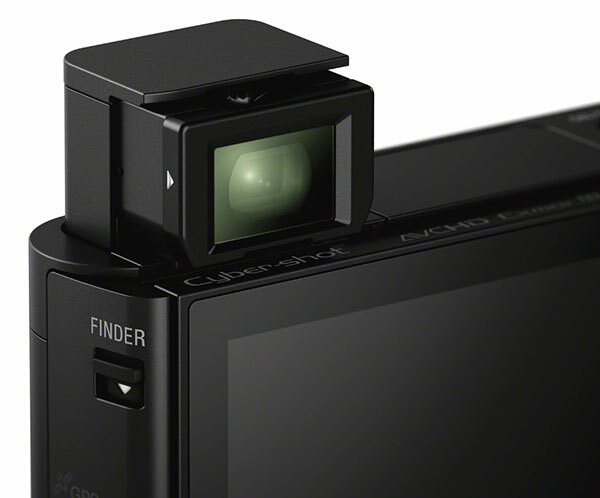 Concealed beneath the top deck of the Sony HX90V is a popup electronic viewfinder that’s raised with a small switch on the left side of the camera body. Closing the viewfinder by pushing it back downwards can optionally power the camera off at the same time. Based around a 0.2-inch Organic LED panel, the display has a resolution equivalent to 638,000 dots. That’s quite a bit lower than the 1,440,000-dot resolution of the popup finder in the RX100 III enthusiast compact, and the panel size is also quite a bit smaller than the 0.39-inch panel used in that camera. 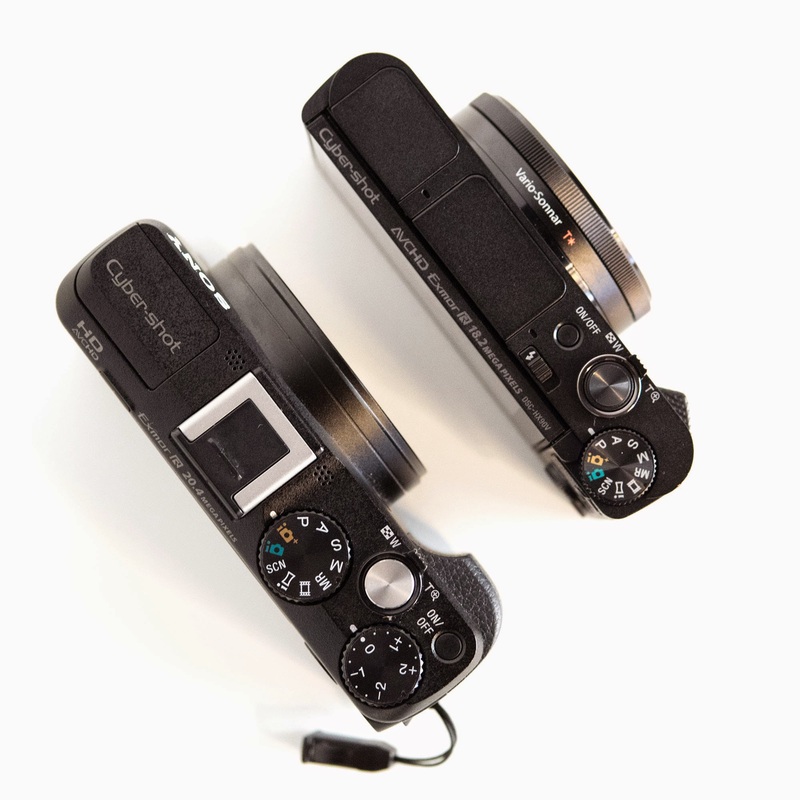 However, it’s worth noting that the reduction in panel size has also allowed a significantly smaller footprint for the viewfinder in this camera, which is actually more compact than the RX100 III, despite its much greater zoom range. Sony rates the viewfinder at 100% coverage, and says it has 0.5x magnification along with an eyepoint of 19.2mm from the eyepiece frame. Brightness control is possible within a five-step range, either automatically or manually adjusted. There’s also a dioptric adjustment of -4 to +3m-1. On the rear deck of the Sony HX90V, you’ll find a 3.0-inch, Xtra Fine-branded LCD panel with a total resolution of around 921,000 dots and a 4:3 aspect ratio. It has a five-step manual brightness adjustment, and is mounted on an articulation mechanism that allows it to be tilted upwards by a full 180-degrees, allowing for self-portrait shooting. For autofocus, you have a choice of single-shot or continuous AF, and can select between wide, center, flexible spot or expanded flexible spot modes. The focus point size for flexible spot can be set to small, medium or large. There’s also a lock-on autofocus function, and a face detection / recognition function capable of identifying up to eight unique faces. Focusing is possible to as close as two inches (5cm) at wide angle, and 8′ 2″ (250cm) at the telephoto position. In addition, a range of picture effect functions allow more artistic looks, including Toy Camera, Pop Color, Posterization, Retro Photo, Soft High-key, Partial Color, High Contrast Mono., Soft Focus, HDR Painting, Richtone Monochrome, Miniature, Watercolor and Illustration. A subset of these — Toy Camera, Pop Color, Posterization, Retro Photo, Soft High-key, Partial Color and High Contrast Mono. — are also available for movie capture. There’s also a Dynamic Range Optimizer function with a five-step manual or automatic range, and this, too, can be bracketed. Sony also includes an Auto HDR function that merges multiple shots in-camera within a range of 1 to 6EV in 1EV steps. Long exposure noise reduction functions by default, but high ISO noise reduction can be tweaked to either normal or low levels. It isn’t possible to disable noise reduction entirely, though. If you’re a fan of panoramic imagery, you’ll be happy to hear that the Sony HX90V also supports Sony’s Intelligent Sweep Panorama function, and allows full 360-degree panoramas to be created and stitched in-camera, as well as the regular Standard and Wide panorama options. Which filetype you can record in — and at what frame rate and bit rate — depends on your capture resolution. XAVC S video allows frame rates of 24, 30 or 60 progressive-scan frames per second, with a fixed 50Mbps bitrate. For AVCHD video, bitrates range from 17 to 28Mbps, and frame rate choices include 24 or 60 progressive-scan frames, or 60 interlaced fields per second. Both XAVC S and AVCHD compression are available only at Full HD resolution. Finally, MPEG-4 compression works at either Full HD or HD (1,280 x 720 pixels; 720p) resolution, and allows either 30 or 60 frames-per-second capture at Full HD, or 30 fps capture at HD resolution. Bit rates range from 6 to 28Mbps. The Sony HX90V can connect to 802.11b/g/n Wi-Fi wireless networks using the 2.4Ghz band, courtesy of a built-in Wi-Fi radio. Pairing with Android devices can be achieved using an NFC Type 3 tag, and one-touch remote / sharing functions are also available by NFC. Since Apple devices don’t support third-party NFC, iOS users will need to pair manually. The HX90V also sports a GPS receiver, capable of recording the location at which each image was captured. It’s also possible to record GPS track logs in-camera. Note, however, that there’s no compass and hence direction information isn’t recorded. The USB 2.0 port also doubles as a charging terminal for the Sony HX90V’s proprietary NP-BX1 lithium-ion battery pack, which recharges in-camera. Both a USB charger and battery pack are included in the product bundle. Battery life is rated at 390 shots on a charge with the LCD monitor, or 360 shots on a charge when using the electronic viewfinder, both figures to CIPA testing standards. Still images are stored only as sRGB JPEG-compressed files. Raw capture and the Adobe RGB color space aren’t supported on this camera.